RED LINES = unresolved street name mismatches between the city (jurisdictional) centerline data and OpenStreetMaps. Click on a red line to get details on the mismatch. The names given are the 'canonicalized' versions used for comparison purposes: all upper case with standard abbreviations applied. Note that for the actual OSM name tags, the convention is mixed case, with everything spelled out, e.g. "Frank Schlessinger Way". BLUE LINES = name mismatches with "fixme" set in OSM, presumably suggesting an OSM edit. This is a way for less experienced OSM editors, to record their observations, for action by more experienced editors. GOLD LINES = fixes that have been made to OpenStreetMap street names. 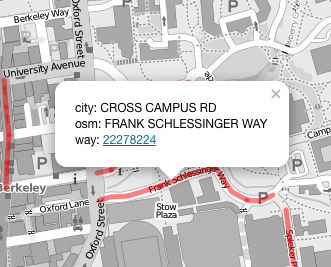 Click on a gold line to see the old and new OSM name. Please allow up to 48 hours for new contributions to show up on the map. 9/1/2014: Berkeley 66% surveyed. 20 OSM street name errors corrected. 2/6/2015: San Jose area initially showing 1231 unique name mismatches. 9/12/2014: Portland area initially showing 1619 unique name mismatches. Check the map for a red line (unresolved mismatch near you.) Click on the line to get the City and OSM names. Go to the location and check the street signs to see what the 'right' name is. Back at your computer, go back to the map and click on the red line again. Then click on the 'way.' This will take you to the location on OpenStreetMaps. Click edit. (You will need to sign up for a free OpenStreetMaps account to edit.) Add a 'fixme:name' tag detailing what you have found. Thank you for helping make OpenStreetMap more awesome! Name mismatches found via SpiderOSM path network matching tool.